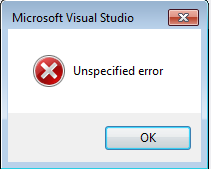 When we try to open the solution in Visual Studio 2012, We get the 'Unspecified error' message on some projects while initializing. We do OK but it comes always. So, we are not able to Open our solution properly and its impact our work. This issue comes due to source control binding. 1. Select your solution in Solution Explorer. 2. Go to the File -> Source Control -> Advanced -> Change Source Control menu. 3. Now rebound the projects that had the error. Note :- After unbinding the all projects we had to quit the visual studio 2012. After the rebinding the projects all projects will load fine. Unbind everything, rebind it all again -- works. Thanks!